Various explanations are possible. 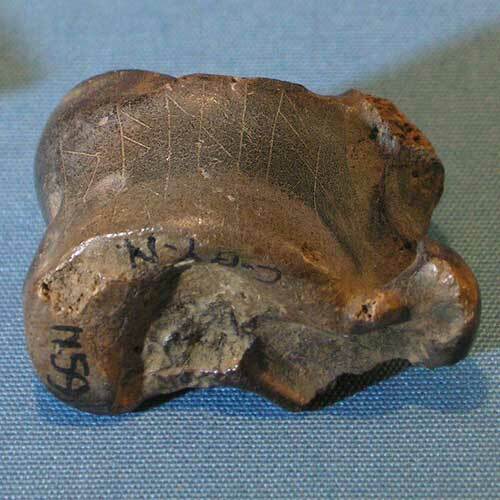 Those who like to think that runes had magical properties in the early Middle Ages might jump to the conclusion that the bone was used for (pagan) divination; unfortunately for this theory, there is no hard evidence that runes were used this way in Anglo-Saxon England, where runic inscriptions appear from the outset in explicitly Christian contexts. David Crystal suggests that the game for which the bone was used was something like ‘hunt the roe’, so it would make sense to label this specific piece. But, of course, there is always the possibility that someone just wanted to show off his knowledge of runic writing, or was fiddling with his knife in a moment of boredom and produced the epigraphic equivalent of a doodle. Ruthwell Cross, east face. Image: Visionary Cross. These questions might seem trivial except that the declaration of an object’s identity is strikingly common in Anglo-Saxon inscriptions. One well-known example is the runic inscription on the front panel of the Franks Casket, which has nothing to do with the pictures that it surrounds but instead is a poetic riddle whose answer is hronæsban, ‘whalebone’, the material of which the box is made. (It’s rather like seeing text next to a picture in a book and thinking that it is a caption for the picture, only to discover that it says something like ‘this picture was printed on acid-free paper’.) Another is the runic inscription on the east and west faces of the Ruthwell Cross, which consists of bits of a version of the Old English poem The Dream of the Rood; the poem describes the crucifixion of Christ from the viewpoint of the cross. Thus the cross itself speaks to the reader, and tells us that it is a cross. Other literary expressions of this impulse to self-identification are the Exeter Book riddles, in which, most commonly, an object speaks and invites the reader to guess its identity. What these and other similar inscribed objects from Anglo-Saxon England have in common is that they remind the reader that writing is a puzzle, a cryptic sort of code. The Caistor-by-Norwich astragalus is a game piece in more ways than one: for just as the game of golf (for example) is at one level just a very complicated way of putting a little ball into a small hole, the runic inscription on the astragalus is an artificially clever way of saying that a deer bone is a deer bone. There is a puzzling element, a challenge to decipherment, in the runic inscriptions on the Franks Casket and the Ruthwell Cross. After figuring out how to read the runes (not particularly easy even if one knows the runic alphabet) and guessing the answer to the riddle or identifying the speaker of the words on the cross, one finds out that the whalebone box is made out of whalebone and the cross is a cross. Maybe one knew that already, but the pleasure was coming to that discovery by the circuitous route of writing. The Old English word run, ‘rune’, originally meant ‘secret, mystery’. Runic inscriptions like these do not attempt to convey information as clearly and efficiently as possible; rather, they call attention to the cryptic nature of writing, the idea that it is a code that requires special skill to decipher. They invite us, and probably the Anglo-Saxon readers who first saw them, to spend time puzzling over written text instead of taking it for granted. And they potentially revive in us, who have perhaps become boringly literate people, a sense of the wonder (that good Old English word, wundor) with which a newly literate or rarely literate culture might see the power and mystery of writing, marvelling at the way it gives to dead objects the life of language. 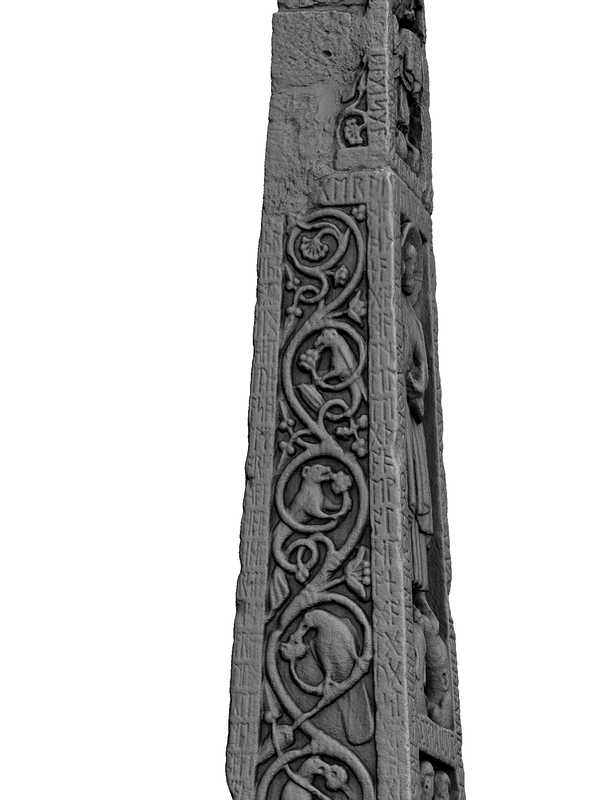 The image of the Caistor-by-Norwich astragalus is by Christer Hamp and can be found in his excellent database of runic inscriptions at http://www.christerhamp.se/runor/gamla/index.html (notes in Swedish). The classic overview of English runic texts is R. I. Page, An Introduction to English Runes, 2nd ed. (Woodbridge: Boydell P, 1999). Extensive work on English runic texts has also been done by Thomas A. Bredehoft (see, for example, the section in his Authors, Audiences, and Old English Verse [Toronto: U of Toronto P, 2009] 49-64), and Elizabeth Okasha. Also worth reading is the chapter on ‘Object and Voice’ in Catherine E. Karkov, The Art of Anglo-Saxon England (Woodbridge: Boydell P, 2011) 135-178. The Caistor-by-Norwich inscription, preserving a form of the word roe, is the first word in David Crystal’s The Story of English in 100 Words (Macmillan, 2012). Hunt games seem to have been popular in medieval Europe; a simple modern game of this type is ‘Fox and Hounds’, which I played in my youth on a checkers board until I discovered that the game could be solved and that the hounds would always win. The rather mysterious medieval game of hnefltafl, mentioned in various northern European sources, was probably a hunt game of this sort. And there is a marvellous poem by the Australian poet A. D. Hope, ‘Meditation on a Bone’, about a more sinister runic inscription from Norway. The Caistor-by-Norwich astragalus appears at the end of Tom Scott’s tribute to W. G. Sebald, ‘Grave Goods’.